In a saute pan heat the olive oil until very hot and then add the shrimp and cook for approximately 1 minute on the first side until a nice golden brown color is achieved. Turn the shrimp over and cook for 30 seconds. Immediately add the grape tomatoes, roasted garlic cloves, chicken stock, white wine, lemon and butter. Allow sauce and shrimp to cook for about 30 to 45 seconds. Add fresh basil and toss together with the shrimp mixture. Remove from heat. 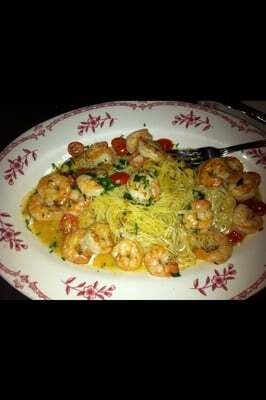 Place 1 piece of garlic bread in the center of the plate and pour the shrimp and sauce on top of the bread stacking neatly and allowing some of the tomatoes and basil to remain on top. Garnish with the remaining garlic bread, half of lemon and parsley.